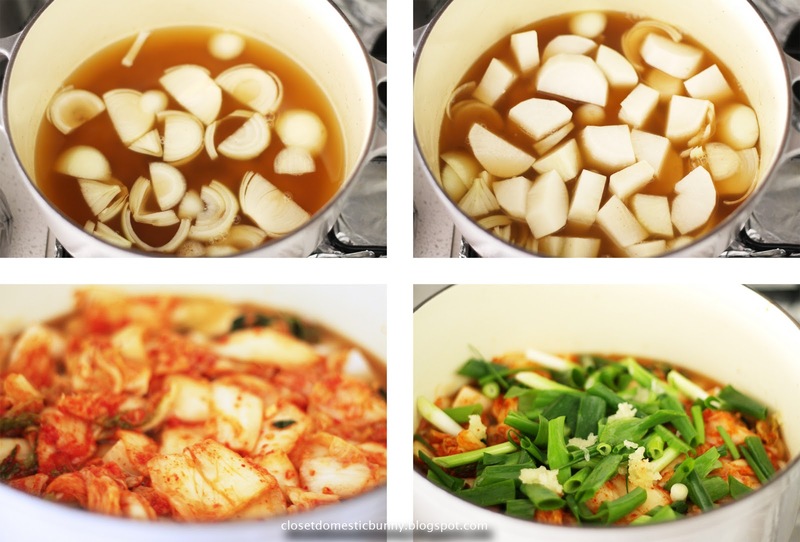 Kimchi jjigae (hangul: 김치찌개) is a korean stew, to be eaten together with rice, containing spicy kimchi, pork or seafood, tofu and other delicious things. This recipe of kimchi jjigae is adapted from Beyond Kimchee's recipe, which I'm quite proud to say turned out beautifully. What prompted me to make this recipe, I hear you ask? I have been watching a lot of Kdrama lately. By a lot, I mean the all-day-cooped-up-in-the-house-only-stopping-to-eat-and-go-to-the-bathroom kind. And every time I'm in one of those korean drama trance, I somehow always ended up eating a packet of the korean nong shim branded ramyun for dinner. Though what I really wanted was something more substantial, with not too many ingredients, hearty and spicy at the same time, and most importantly achievable for me to cook at home. The kimchi jjigae fits the brief perfectly. On a side note, one of the series that I really liked lately is called The Man Who Can't Get Married (hangul: 결혼 못하는 남자). It's about this overbearing guy with a touch of OCD, who is also a bit quirky and socially inept, but really quite smart. It's funny but not overly melodramatic like most korean dramas. It may seem like there's a lot of ingredients, but I tell you it's worth it. I've tried to make kimchi jjigae more than 5 years ago (during another phase of kdrama addiction) without having all the ingredients. It was horrible. Cut the head & tail end of the daikon. 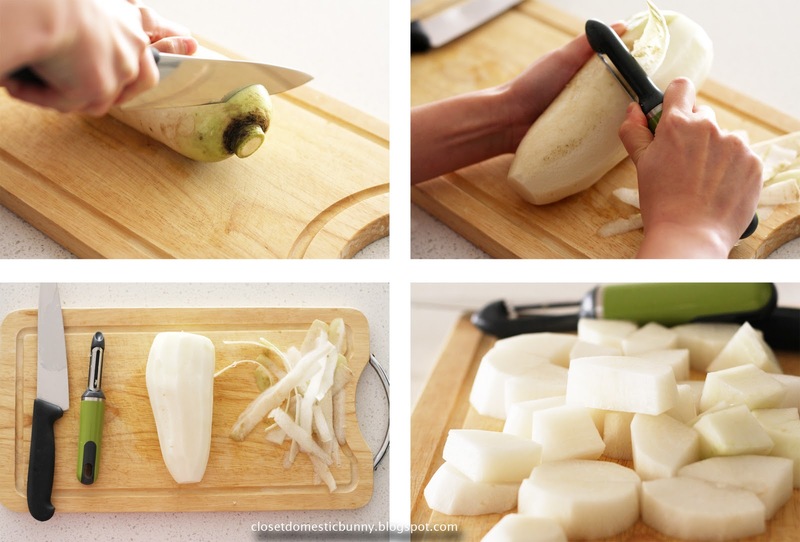 Peel the dress off your daikon to reveal its pure white skin. Then cut into small bite-sized pieces. 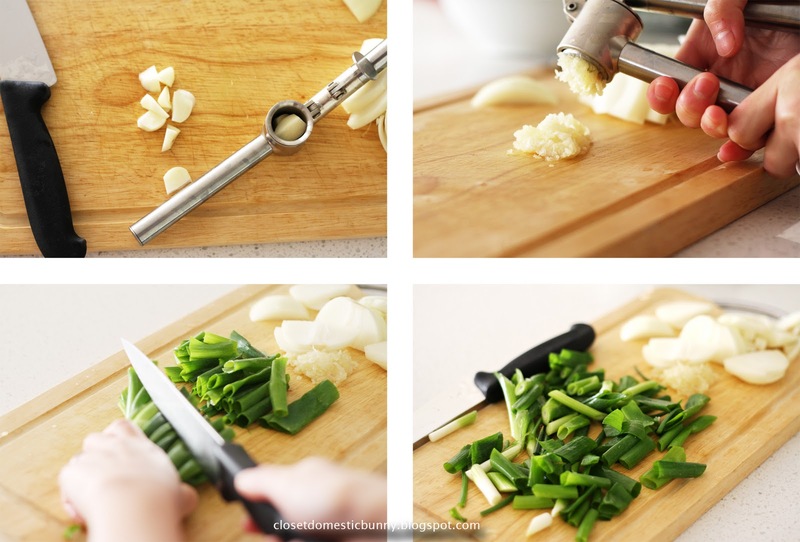 Mince the garlic, love my ikea koncis garlic press. Cut the spring onions on an angle to make it look pretty. Reserve a handful for garnish. 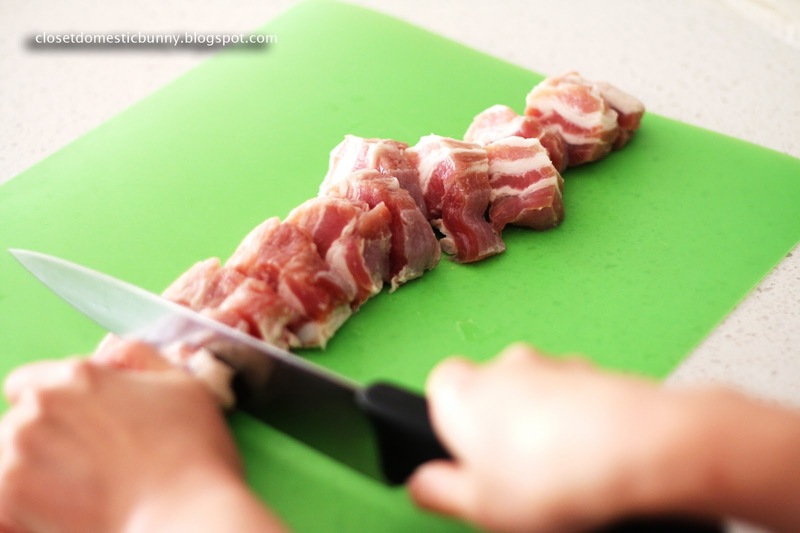 Cut the pork into 2 cm wide pieces. 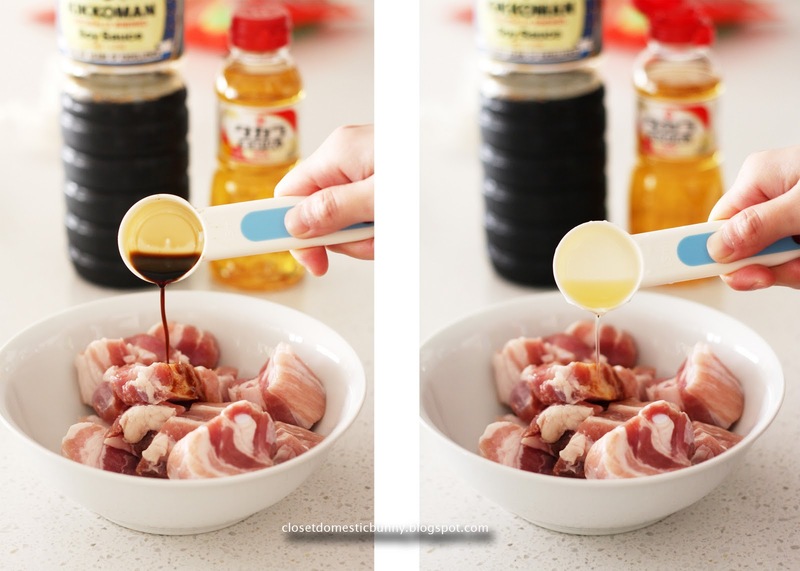 Marinade the pork by adding 1 tablespoon of soy sauce. Add half a bulb of the minced garlic. Yes, only half. Not all. Just half. 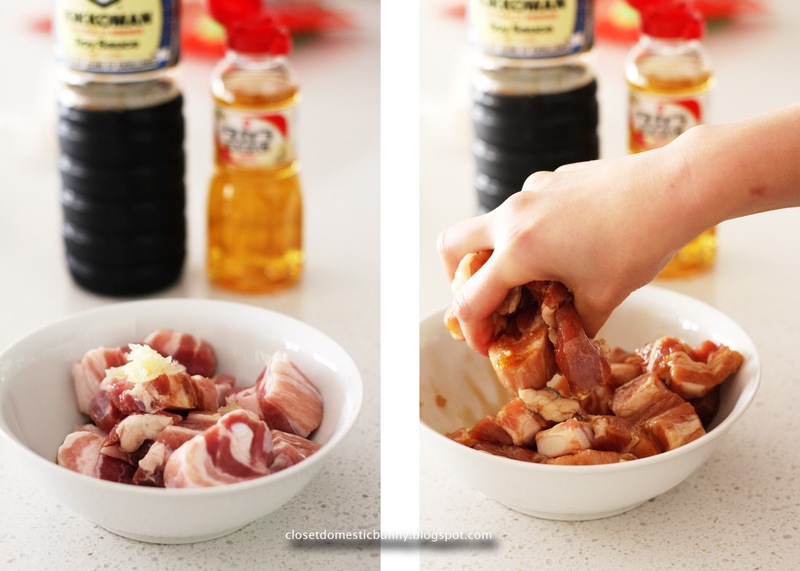 Massage the marinade into the pork. Show it some tender loving care. Cover with cling wrap and set aside in the fridge until we're ready to use them. Now that prepping is basically done, we're moving on to the making of the stock. Start with dry miyeok. 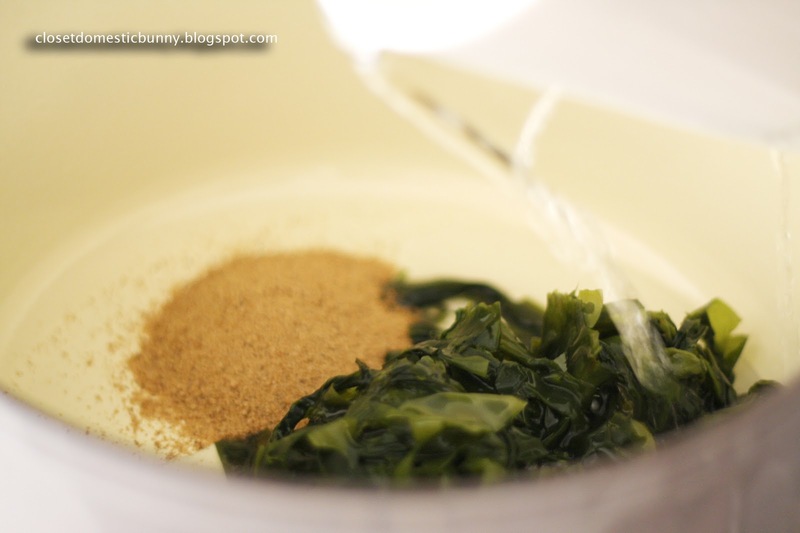 Miyeok is a type of seaweed, mostly commonly known under its Japanese name, wakame. 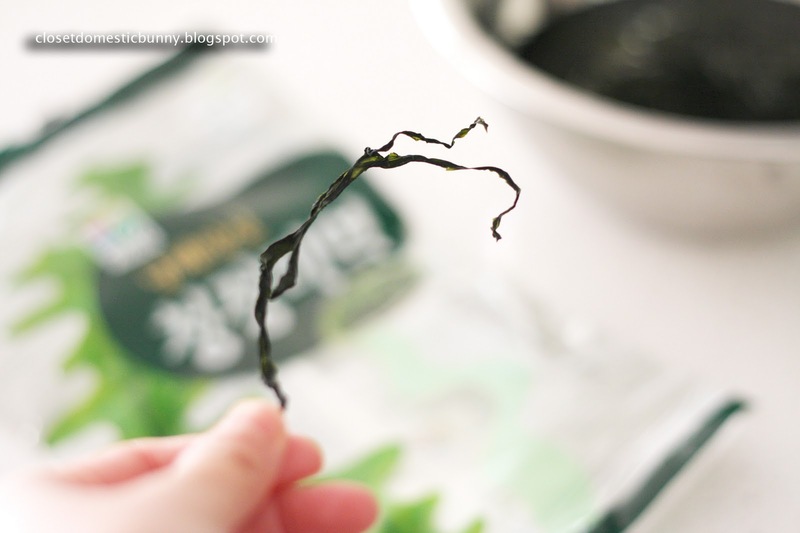 I've had in my pantry, half a packet of this dried miyeok for ever now. If you've got it, and you're happy, clap your hands. 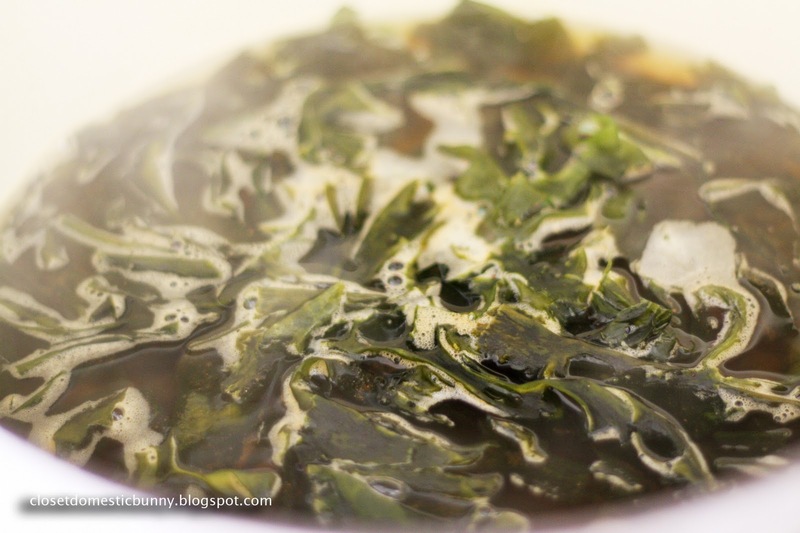 To make the soup base, I added three tablespoons of anchovy stock powder to a large enamelled french oven. Add the drained miyeok. Just to be sure, to be sure, that's without the soaking water, OK? Since I can't read korean, I looked on the internet, it says the ratio is 1 cup of water for every tablespoon of anchovy stock powder. Turn up the heat to the boil, then simmer for 10 minutes. If you read Beyond Kimchee's original recipe, it'll call for konbu for this stock. But for the life of me, I cannot find it. Having a language barrier with the Japanese storepersons did not help either. Yes, storepersons, plural, I probably went to a gazillion stores to look for them. Look at that. After 10 minutes, your stock should deliciously taste of the sea. Take the miyeok out of the stock. If you're like me, not wanting to waste anything, the miyeok is delicious to eat, as is. 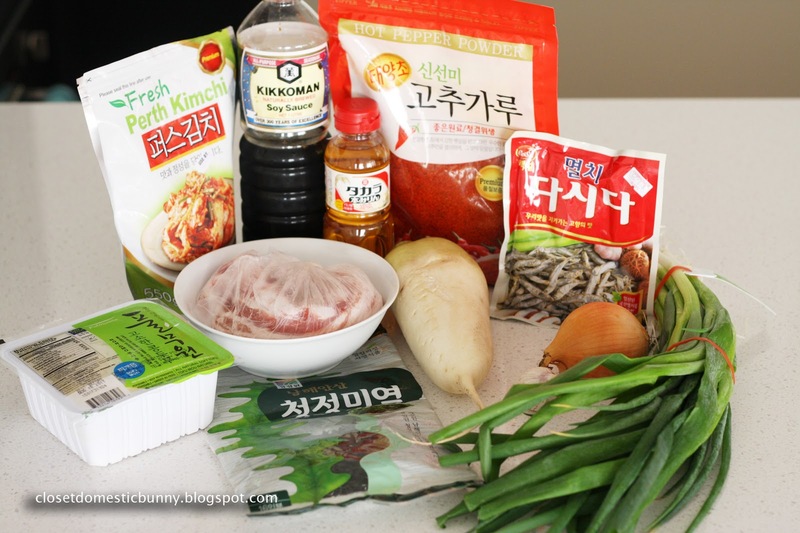 But, if you want to be a bit more technical, there's a lot of really cool banchan recipe using miyeok out there, one of which is here. We're almost there! Oh, I'm so so excited. Layer your ingredients inside the pot containing the stock. Start with the ingredients that need a bit more time to cook. I start with the onions, I do like them meltingly soft. Then the daikon. By the looks of it, I got a slightly older daikon, so it'll need an even longer time to cook than usual. Then the gloriously tangy, spicy kimchi with all its juices. I used new kimchi because I couldn't wait for my kimchi to rot. Eventhough they say old kimchi is better for this dish than new kimchi, I think my kimchi jjigae was still pretty darn delicious. The green spring onions are next. Along with the last half of the minced garlic. Add the pork and its marinade to the pot. If the stock doesn't cover the ingredients, add water. I had to add 2 cups of water to mine. Now we're ready for some action. Cover the pot with the lid and turn up the heat as high as you can. Once it's boiling, turn down the heat as low as you can, to simmer for 30 minutes or more until the daikon is just soft to your liking. It actually ended up taking me about 45 minutes. Meanwhile, go ahead, do your washing, watch some more korean drama, and have a cup of tea, relax. After about 30 minutes of the stew cooking in the pot, I got ready for the next stage by making the tofu smearing paste, in a small bowl. Combine 1 tablespoon of korean red pepper powder (not red pepper flakes) with 1 tablespoon of mirin into a paste. If the red pepper paste is too thick for easy smearing, add 1-2 teaspoon of stock from the pot to the paste to dilute. To save on washing up too many dishes, I slice my soft tofu in its own container. I'm efficient like that (read: lazy). Stir the stew ingredients so they are all doing a tango with each other. 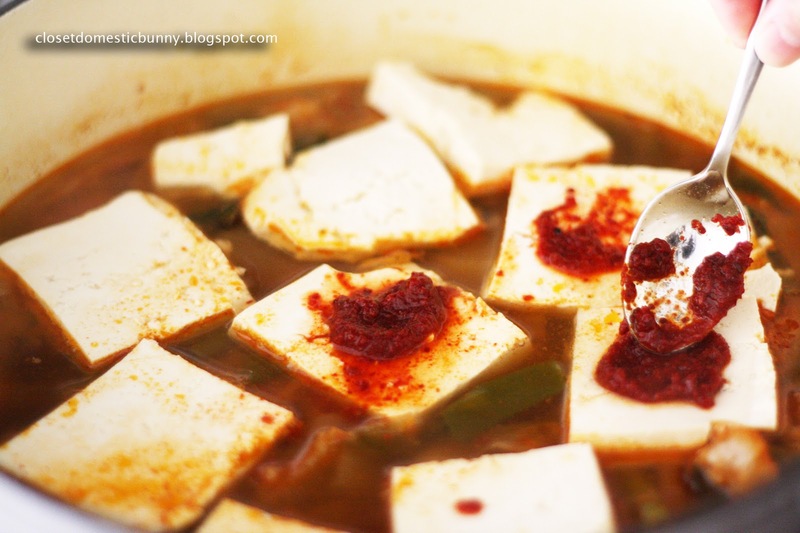 Add the soft tofu onto the pot and smear with the red pepper paste, simmer for another 10 minutes. Serve it, garnished with the spring onions you've set aside previously. I should've probably cut the spring onions a bit smaller for the garnish (or maybe much much much smaller), so it doesn't look as silly. Fortunately, my tummy doesn't discriminate dishes based on their appearance. It's very equal opportunity like that. Going back a step, I actually like mine really quite spicy, which you might not, it's really up to you, just saying. But, I tasted mine, it has the punch of the kimchi, but not spicy enough. I dissolved a few more tablespoons of red pepper powder into the soup. I let it simmer for another 5 minutes before garnishing with the spring onions. Problem solved. 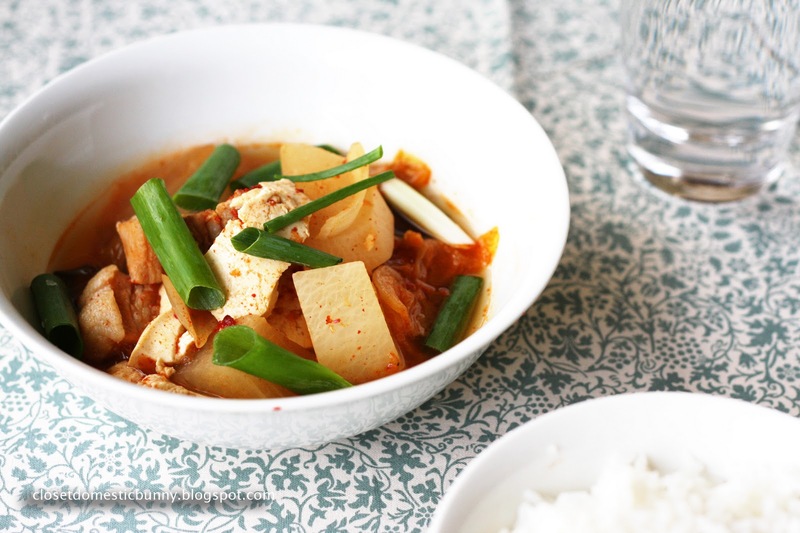 Sour & spicy kimchi jjigae. I'd always make sure a full glass of water is at the ready. On a side note, I did find a slight daikony aroma thanks to the daikon I added to the stew. I didn't mind it one bit. Combine all the "Pork marinade ingredients", cover with cling wrap, set aside in the fridge. 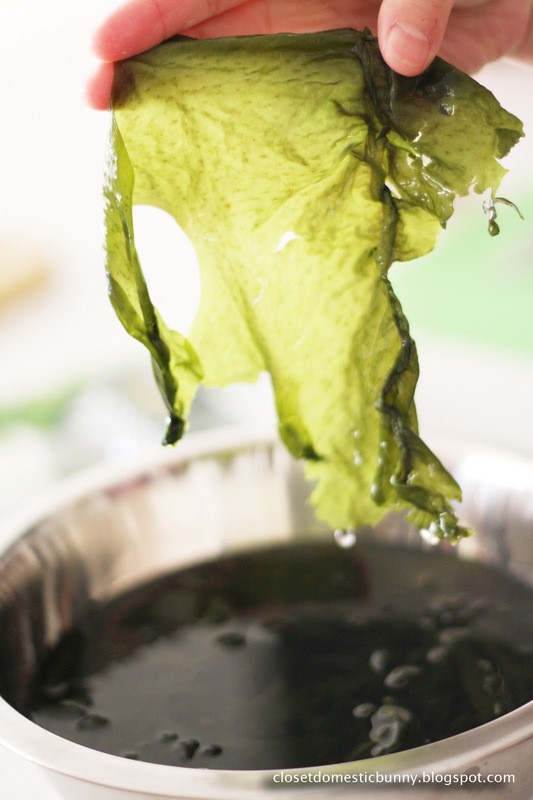 Soak the dry miyeok in water for 20 minutes until they're reconstituted. Drain the water. Combine the drained miyeok with the rest of the "Anchovy stock ingredients" in a large enamelled french oven or your largest heavy-bottomed pot. Bring to a boil and simmer for 10 minutes. After 10 minutes, remove the miyeok from the soup stock. The miyeok can be made into a lovely banchan. Add the stew ingredients into the soup stock. Start with the onion slices. The daikon pieces. The cut kimchi and all of its juices. The spring onions and half a bulb of the minced garlic. Add the pork and its marinade. Top up the water until it covers all the ingredients, about 2 cups. Turn the heat up to bring to a boil. 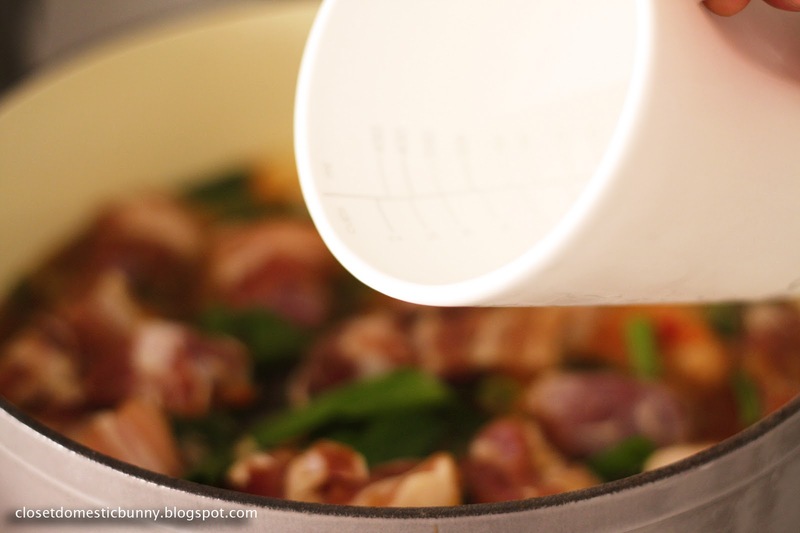 Once boiling, lower the heat to a simmer, cover with the lid and simmer for 30 minutes. 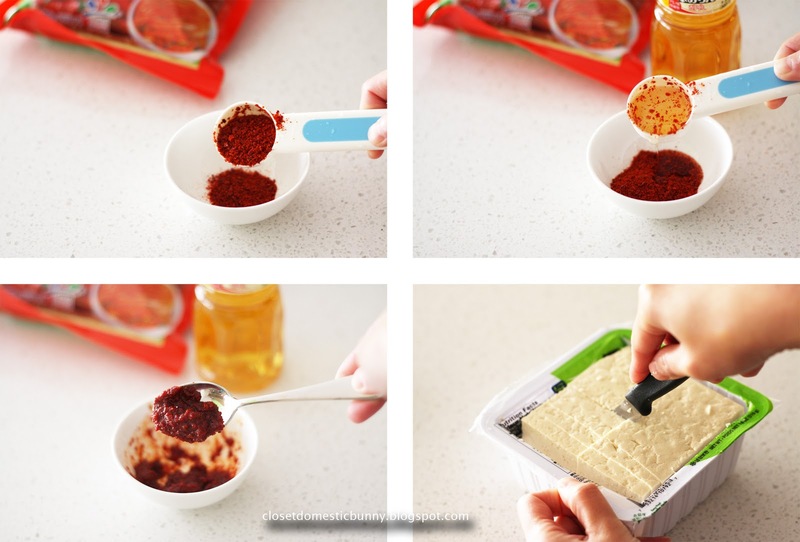 Make the soft tofu pepper paste by combining 1 tablespoon of red pepper powder with 1 tablespoon of mirin. 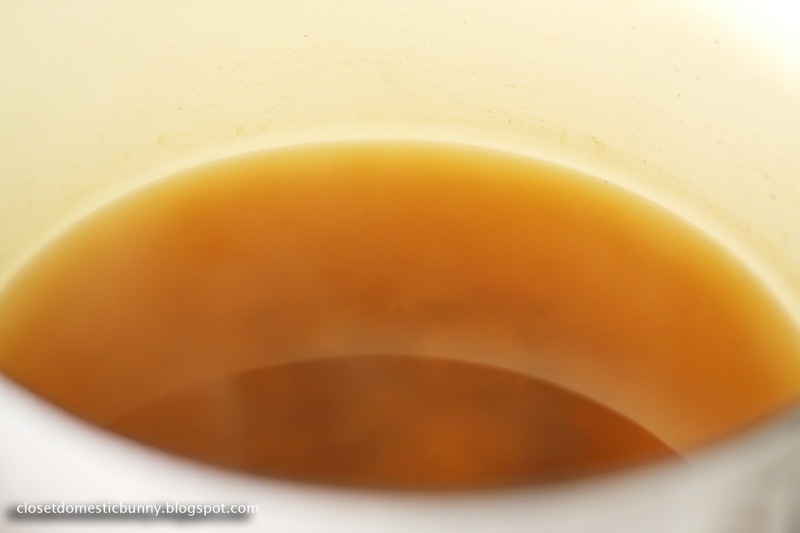 If it's too thick for smearing, add a few teaspoons of the stock. 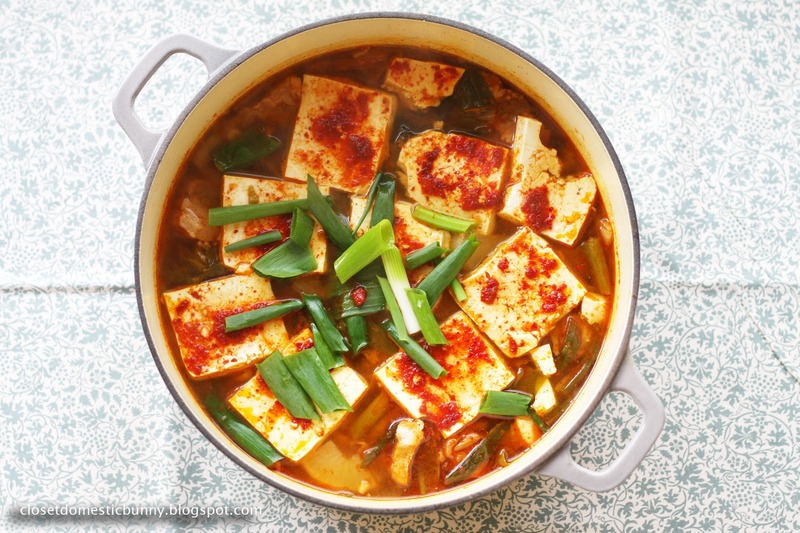 After the stew has been simmering for 30 minutes, stir the ingredients and add the soft tofu pieces on top. Smear the paste on the tofu. Cover with lid and simmer for further 15 minutes. 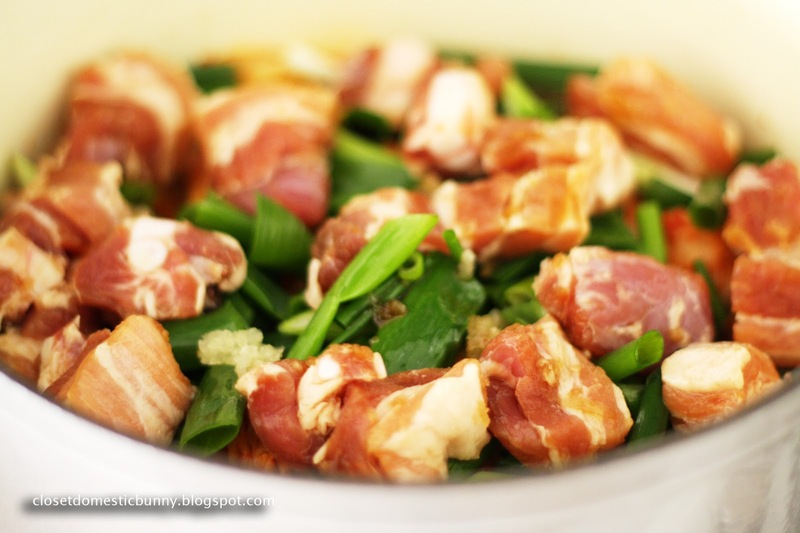 Serve warm, topped with a spring onion garnish, accompanied with a bowl of rice.